Click on the artwork above to go to Audible. Thornton W Burgess was a conservationist and author of children’s stories. He loved the beauty of nature and its living creatures so much that he wrote about them for 50 years. By the time he retired, he had written over 170 books and 15,000 stories for the daily newspaper column. In The Adventures of Old Man Coyote, Peter Rabbit hears a new sound that frightens him and the other animals of the Green Forest. The sound is that of a new predator in the Green Forest, Old Man Coyote. Granny and Reddy Fox don’t want competition in the Green Forest and try to trick him into leaving the forest. 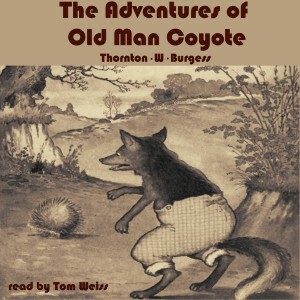 But Old Man Coyote proves himself to be very clever and fair.